The prequalification process for bids for the Rubber Research Institutes of Malaysia (RRI) land in Sungai Buloh, Selangor, will start by the end of this year, says a source close to the Employees Provident Fund (EPF). The source said EPF would call for the prequalification bids as soon as it gets the government's nod for the proposed development of the land. Pre-qualification bids would be opened to developers who meet the requirements, he said. 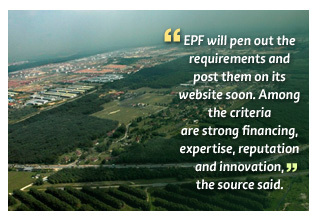 "EPF will pen out the requirements and post them on its website soon. Among the criteria are strong financing, expertise, reputation and innovation," the source said. EPF is the land owner and master developer of the project. It is buying 890ha of the available 1,215ha RRI agricultural land from the Federal Government for over RM2 billion. The pension fund is expected to carve out the land in parcels of 20ha to 200ha each, depending on the use of it. The idea is to build low-end to luxury housing and commercial properties. The balance of the RRI land is to house the Malaysian Rubber Board hub (217ha) and the My Rapid Transit (MRT) Sungai Buloh depot (72ha). The master planning for the land development is being carried out by EPF's wholly-owned unit, Kwasa Land Sdn Bhd. An official from the EPF said Malaysian Resources Corp Bhd (MRCB) was not involved in the master planning. "MRCB's involvement in the project is on an arm's length basis. Like other developers, they will also have to bid for the land parcels," the official told Business Times. EPF has a controlling stake in MRCB, the master developer of the KL Sentral project in Brickfields, Kuala Lumpur. It is understood that several property players like Glomac Bhd, Mah Sing Group Bhd and Gadang Holdings Bhd have presented their ideas to the EPF. The redevelopment of the RRI land forms part of the greater Kuala Lumpur Strategic Development initiative, a project under the 10th Malaysia Plan. The southern portion of the RRI land, which includes parcels bordering the Tropicana Golf & Country Resort, falls under the jurisdiction of the Petaling Jaya City Council. The northern portion, which houses the MRT depot, comes under the purview of the Shah Alam City Council.